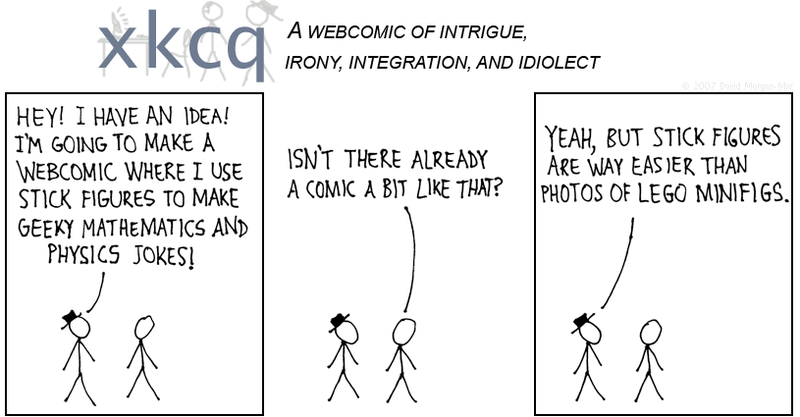 1 [caption]: xkcq - A webcomic of intrigue, irony, integration, and idiolect. 1 Stick Figure 1: Hey, I have an idea! I'm going to make a webcomic where I use stick figures to make geeky physics and mathematics jokes! 2 Stick Figure 2: Isn't there already a comic a bit like that? 3 Stick Figure 1: Yeah, but stick figures are way easier than photos of Lego minifigs. xkcd is a webcomic that uses stick figures to perpetrate gags on academic topics such as science and linguistics, as well as making the occasional forays into romance, social commentary, and pop culture. It's written by Randall Munroe, a guy with a degree in physics. Now where have I seen something like that before...? Look, if you're reading this, odds are you'll enjoy xkcd. Go check it out. My only regret is that I didn't think of this joke first. Oh, and by the way, "xkcq" is worth 8 more points than "xkcd" in Scrabble, or a whopping 30 more if both are played optimally on a triple word score. Nyahhh. 2016-09-19 Rerun commentary: Its mind-boggling to think that here I was telling people about this cool new webcomic that they probably hadn't heard of yet. Last Modified: Monday, 19 September 2016; 03:11:03 PST.